Determined to get the ball rolling with my path to Visual Development (like spiritual enlightenment), I've decided to take on some art challenges to hone my skills. So, I turned to the Internet for ideas and came up with these awesome prompts/challenges for artists. Challenge #1: Make a book cover for your favorite classic novel. While not really a classic novel, this novella really means a lot to me. When I first read it in senior year, the story is so meaningful and full of explorations about life, humanity and love. "One runs the risk of weeping, if one lets himself be tamed." 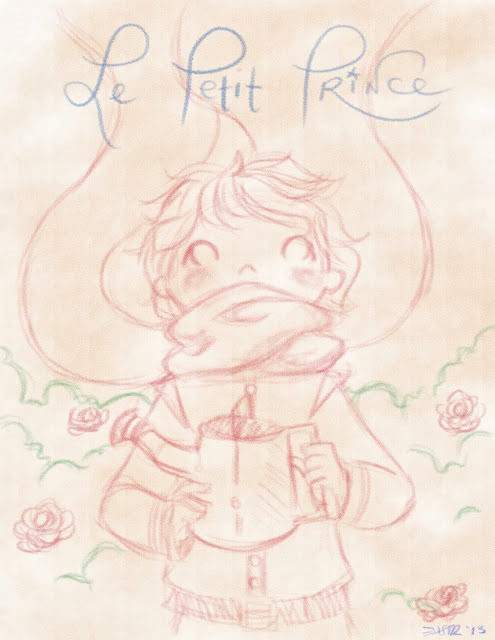 Back then, we had been given a project to make a project of any sort inspired by The Little Prince. I had made a journal, sketch, scrap book. I chose my favorite quotes, made illustrations and then essays about why those quotes meant a lot to me. I put a lot of heart and of myself into that work that year. The best works were displayed in the school lobby for the whole school to see. My work was not one of those displayed. But, to my surprise, when we got our works back from our teacher, he had slipped in a little note saying that he had really wanted to display my work in the lobby, but thought that my personal thoughts that I shared with him in my project might not be something I'd be comfortable sharing. I treasured his consideration and it meant more to me than having my work displayed. It just showed how much this book has affected me. Since then, I've also come up with a few The Little Prince inspired projects. In college, I used the idea to create a Writer's Manual for my Narrative class. I always get high grades when I am inspired by this, because it always triggers passion from me.